An Emerald Coast Charitable Benefit. Bay Fishing Tournament, Songwriting Competition, Concert, and More! Bay Fishing Tournament Kick-Off with Auction and Live Music at Harbor Docks Restaurant! An evening of music, an Auction with incredible prizes, food, and Fun! ALSO: Captain's Meeting to go over Tournament rules, etc. See the Fishing Tournament tab at the top for Details. Songwriter’s Contest Finale! Finalists will perform and audience participation helps to select winner! Enjoy an evening of music featuring Nashville Recording Artists and Songwriters! 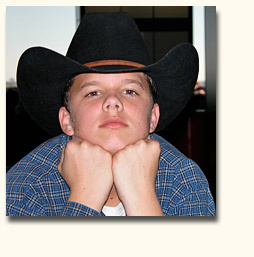 Jeremiah was a vivacious young man with a big personality who had a zest for life and living. Many might say he was born with a smile on his face and a fishing rod in his hand. 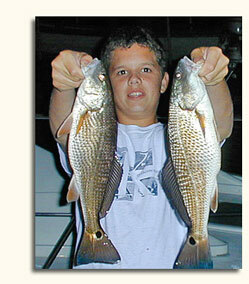 He grew up living and loving the beaches of the Destin area, whether fishing, swimming or surfing. He attended school in Destin, Niceville High School and graduated from Freeport High School in May of 2005. Jeremiah was known by many of Destin’s residents, whether from school activities or from watching the fish being brought in down on the docks. He was interested in everything and especially loved music and the drama of the theater, and in particular he loved the magic of clowns and mimes. One of his favorites was Marcel Marceau, the world’s most famous mime. Jeremiah was happiest when those around him were sharing a smile with him. We hope by having this event that Jeremiah's memory will serve others by encouraging people to become more involved in our community and to be more aware of the challenges that face our children. "I know How He Feels"
More Items to be Added! A Six Week Songwriters Contest to be judged by Nashville Music Industry Professionals! Finalists will perform at The Swamp, Saturday, September 27, 2008. Audience participation to determine the final winner! Grand Prize: A trip for two to Nashville, Tennessee, 2-night hotel stay, and studio recording time with Nashville Music Industry Professionals. Trip includes hotel accommodations for two nights and a $50 gas card. Grand prize valued at approximately $500. Be sure to include your Name, Address, Phone, Email with your submission! No purchase is necessary; there is an entry fee of $20 per song. Must be a legal U.S. resident to enter. Contest open to any amateur songwriter, defined as a writer who has not earned in excess of $5,000 from songwriting related royalties, advances or works for hire within the last 12 months. Signature of parent/guardian required for each entrant under 18 years of age. All contests are open to the general public nationwide, except for employees, agents, subsidiaries and affiliates of WYZB/105.5 THE WOLF, other participating Cumulus stations, Cumulus Broadcasting LLC, the Children’s Advocacy Center, First Fruits, participating sponsors, their immediate families, household members and all other radio industry employees. To qualify, songs must be original compositions of the person or persons entering them. Songs may have multiple co-writers, but please designate one name only on the application. Contestant may enter as many songs as he/she chooses, but each entry must have a separate application, CD, cassette or MP3 file, lyric sheet and entry fee. Songs can be copyrighted, however this not required. Children’s Advocacy Center, First Fruits and other sponsors, as well as their employees and volunteers assume no responsibility for non-copyrighted songs. Songs to be submitted with an application and entry fee, on CD, cassette or MP3 file along with a lyric sheet, typed or printed legibly. CDs, cassettes and lyric sheets will not be returned. The contest will begin Friday at midnight, August 1, 2008, and will run through Saturday, September 27, 2008. Each entry requires the following elements: one song five (5) minutes or less (mp3, CD or cassette); a lyric sheet -- no lyrics necessary for instrumental compositions; a payment -- $20.00 per song—credit card payment required for on-line entries and check or money order payment for mailed entries; a completed application; entries may be emailed to: hookslinessingers@me.com or mailed to: H,L & S, P.O. Box 1237, Niceville, Florida 32588-1237. All entries must be received by September 17, 2008 to remain eligible. There will be one grand prize: a trip for two to Nashville, Tennessee, with studio recording time with Nashville Music Industry Professionals. Trip includes hotel accommodations for two nights and a $50 gas card. Grand prize valued at approximately $500. Songs will be judged on originality, melody, lyric, composition and structure. Songs will not be judged by the production quality of the demo, or the performance of the singer. Songs will be judged by a select group of music industry professionals comprised of noted producers, writers and industry executives. The panel of judges is solely responsible for judging the preliminary round and determining four (4) finalists. 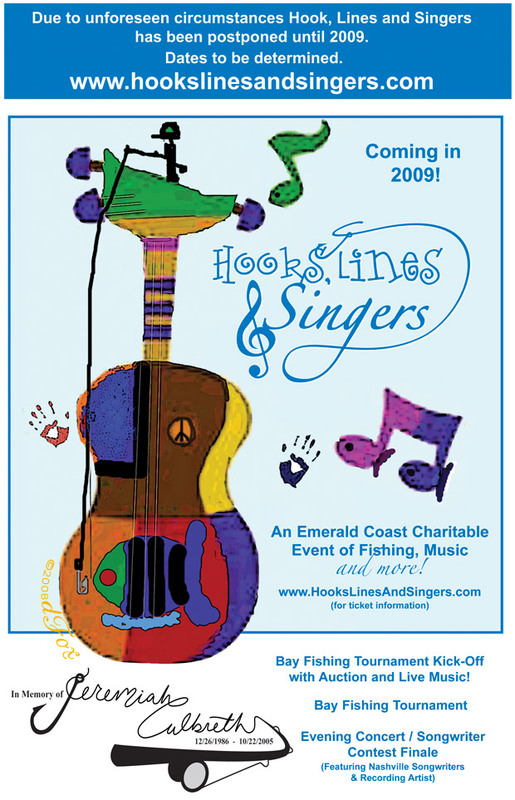 The four (4) finalists will be announced at the “Hooks, Lines & Singers” show on Saturday, September 27, 2008, at The Swamp. The finalists must agree to perform their songs before a live audience at The Swamp, Fort Walton Beach, Florida, that evening. Crowd response will determine the grand prize winner. Finalists will not receive any payment for travel or accommodation expenses in order to be present at The Swamp on September 27th. In some circumstances the Grand Prize winner may be chosen the week before or the week after Saturday, September 27, 2008. The Winner’s name may or may not be announced on the air by WYZB/105.5 The Wolf. In the event of a tie, the winner will be determined by random drawing or another means deemed appropriate by Children’s Advocacy Center and First Fruits representatives. The representatives conducting the contest will determine all winners; their decisions and interpretations of these rules shall be final. All State, Local, Federal and or other taxes, duties, tariffs, title fees, licensing fees, or other fees for prizes awarded become the sole responsibility of the winner. All those who win a prize / prizes valued at over $600 will be issued an IRS form 1099 to report their winnings. All prizes are awarded “as is.” Prizes are nontransferable and cannot be exchanged for other trips, prizes or cash. WYZB/105.5 THE WOLF shall not be responsible for the failure of participating sponsors to deliver prizes as promised. All entrants and winners agree that WYZB/105.5 THE WOLF, Cumulus Broadcasting LLC, their affiliates, and sponsors shall have no liability and shall be held blameless for any injury, misfortune, or damage to either persons or property insured by entering, participating in, winning, or losing any contest by use or non-use of any prize received. Grand prize winner must complete winner’s affidavit and trip winner information in person at WYZB/105.5 THE WOLF during regular business hours and within ten business days of winning. After such time, ownership of said prize reverts to Children’s Advocacy Center, to be disposed of at their discretion. The winner then loses all claims and rights to said prize. State issued identification must be presented to claim prize. Winner will be required to fill out a prize fulfillment package. All entry blanks, forms devices and materials, as well as all the information contained on or within, gathered during the course of entry, shall become the sole property of the station and sponsors to be used, disposed of or destroyed at the discretion of the station, Children’s Advocacy Center and First Fruits. Such use including, but not limited to, enrolling entrant in one or more of the station’s listener clubs and sending entrant correspondence and solicitations with regard to such clubs. Further the Children’s Advocacy Center, First Fruits, and Cumulus Broadcasting LLC is not responsible for lost, mutilated, illegible, misdirected, late, stolen, incorrect or incomplete entries. Sponsors are not responsible for any incorrect or inaccurate information entered by website users, and assumes no responsibility for any error, omission, interruption, deletion, defect, delay in operation or transmission, communications line failure, theft or destruction or unauthorized access to the website. All winners agree that the Children’s Advocacy Center, First Fruits, Cumulus Broadcasting LLC, their affiliates and sponsors may broadcast or publish their name, city of residence, photo, video tape, film or any other likeness, including their voice, recorded or live, for any reason Cumulus Broadcasting LLC, their affiliates and sponsors deems necessary without compensation. All winners will be further required to hold the Children’s Advocacy Center, First Fruits, Cumulus Broadcasting LLC, their affiliates and sponsors, blameless and without liability for such publication, broadcast or use. Sponsors reserve the right to end a contest at any time upon advanced notice to the public. Sponsors reserve the right to limit the number of times an individual may enter a contest or drawing. Sponsors reserve the right to require contestants to be present at event in order to win their prize. Sponsors reserve the right to change any of this promotion and or the promotional elements. Odds of winning are based on songwriting skills of entrants. Violations of any of these rules or attempts to win any contest by fraud, deception, or cheating shall be grounds for the station to disqualify that individual from participating in all current and future contests and events at the sole discretion of the station, as well as forfeiture of any prize or prizes won by fraudulent means. for two for Fishing Tournament.